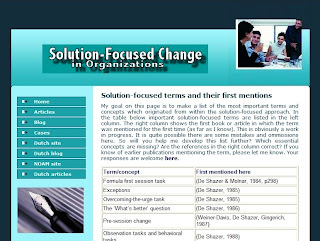 I have made a page about solution-focused terms and their first mentions in publications. My goal on this page is to make a list of the most important terms and concepts which originated from within the solution-focused approach. In the table on that page important solution-focused terms are listed in the left column. The right column shows the first book or article in which the term was mentioned for the first time (as far as I know). This is obviously a work in progress. It is quite possible there are some mistakes and ommissions here. So will you help me develop this list further? Here is the page.